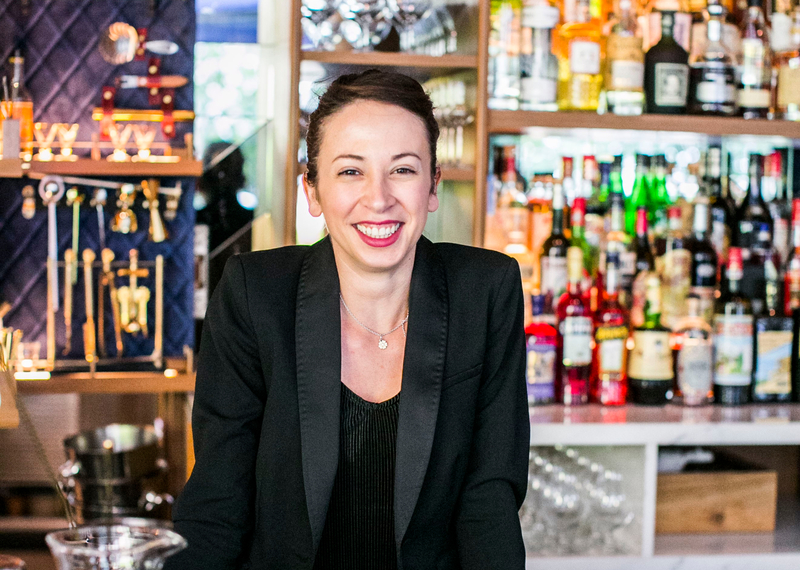 Seeing Palmira Bertuca behind the bar is a pick-me-up in itself: armed with a heartwarming personality, a beaming smile, and killer bartending skills, it’s easy to see how Palmira’s won the heart of patrons at Marcello, Singapore’s first Italian cocktail bar, again and again. We sit with Palmira and talk life, love, and everything in between. You started bartending at the age of 18 – what made you decide to choose to bartend as a career? I actually fell into bartending by mistake – I guess you could say that bartending found me! A close friend of mine told me about a job in a club, where I could work to earn some extra cash over the weekends. I was only 18 years old at the time and was still studying. I fell in love with bartending, and haven’t worked another job since! As a female bartender in an industry dominated by men, it must have been challenging to get to where you are now. What’s one experience you would never forget? It’s true that bartending is typically thought of as a male-dominated industry, but I think women are really starting to make their mark, too! I’ve always found that I’ve been judged for my knowledge and skills as a bartender, as opposed to the fact that I’m a woman; this has been the case everywhere I have worked, too, so I really do think that attitudes are changing. What advice would you give to someone who is looking to venture into a career in bartending? To be truly passionate about bartending and mixology – bartending truly becomes part of your life, so you need to be fully committed and really enjoy your time behind the bar. A large part of our job is interacting with customers, so we need to really believe in and love what we’re doing, or else it will show! I’d also say to read as much as you can to make sure you’re at the top of your game and make sure that you take care of yourself – drinking lots of water and making sure you get enough rest are both really important! They say that taste – much like music – can transport you to a particular past memory. Is there a drink that does that for you? The Americano cocktail was the first drink I made at home for my parents when I was a young bartender. I was still new to the industry but was already madly in love with my job, and now, whenever I make this drink I remember that passion I felt. Also, whenever I drink Vecchio Amaro de Calpo, I’m taken back to my younger days when I didn’t know what Amaro really was yet – I remembered it always being in my grandparents’ fridge, and I used to have small sips from my mum’s glass when she was enjoying it after dinner. If you could choose to bartend for 3 of the most influential/famous people in the world, who would they be? Michelle Obama, so I could ask how she won Barack’s heart! Dr Dre, so I could hear all of his cool stories about NWA. The best city or country with the best drinking scene is…? Definitely London – it’s the most vibrant city in the world, and there is so much happening every day. The bartending scene is very competitive, too, so if you make it in London you can do it anywhere! My favourite bars there are Bar Termini, The Connaught Bar and, of course, The London Edition. Second only to London and New York, though is Singapore, which is by far the fastest growing city in the international bar scene, and I’m so humbled to be part of this. If you weren’t bartending, what do you think you would be doing now? I would probably be unemployed! (laughs) Jokes aside, I really love dealing with people and being part of their experience. A great experience starts from the moment they make a reservation, or when they walk into the bar and have someone friendly chat with them. If I wasn’t working as a bartender, I think I’d still want to be part of that, so I would probably be working in the industry in some other capacity. What’s your favourite ingredient to use when concocting a drink? A dash of Fernet and/or a pinch of salt – both have the power to soften the edges of a drink. Fernet can give a totally new dimension to a drink, whilst salt can enhance the sourness and zest within a cocktail. If you had to drink one thing for the rest of your life, what would it be? My favourite cocktail has to be a Negroni – why? It’s the one drink that you can describe with one word: Balance. The Campari with the Vermouth are in perfect harmony, whilst the Gin adds that extra kick, making the Negroni one of the most popular cocktails in the world. It’s one thing Italians can be very proud of… second only to Pizza Napoletana! An interesting fact about yourself would be? I love to travel, and I’ve lived in four different countries so far. While Marcello only reveals itself in the evenings, in the daytime it’s home to Publico Deli, the neighbourhood’s favourite casual Italian deli serving all-day breakfast and fresh brews. Pop by Publico and have your share of hearty Italian eats before heading to Marcello for a taste of Palmira’s concoctions! Chope’s Top 10 favourite entries for #ChopeBites!